It’s a local drama like no other on the small screen – tough, terse and totally gripping. This is Lockdown, Mzansi Magic’s newest and edgiest drama series to date. Set in a fictional high security female prison, this Black Brain production brings maximum drama delivered by authentic characters. Their fascinating backstories will hold viewers enthralled as they unravel to reveal the paths that led them into prison and behind locked gates. 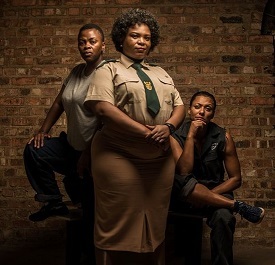 The motley crew of Lockdown’s female inmates is led by the tough Ma Z played by Dawn Thandeka King who was born in Eshowe, KwaZulu-Natal, and studied drama at Technikon Natal (now Durban University of Technology), graduating in 1999. She is best known for her role as Lindiwe Xulu on Uzalo (SABC1 drama Series). Ma Z is a leader who wants nothing more than to gain her freedom so that she can become a good and present mother to the daughter she left on the outside. Cunning and not beyond using manipulation, she co-ops those she can – be they other inmates or wardens – to meet her end goal. One of those people happens to be the beautiful and talented Monde (Zola Nombona), a young woman who left the cocoon of her small town life to pursue fame and fortune in the dazzling lights of Egoliwood. Instead, what she got was infamy, thanks to her wily money-hungry boyfriend/producer Zakes (Luxolo Ndabeni), who introduced her to a notorious lifestyle that landed her in jail. Ma Z’s arch rival is the tough-as-nails prison boxing champ Tyson (Lorcia Cooper), who literally fights her demons with her fists. Temperamental, intimidating and confrontational, Tyson wants to rule the prison’s other inmates with an iron fist and has her sights at dismantling any kind of hold that Ma Z has. Complete control is her ultimate prize. The often-delusional Slenda (Nomsa Buthelezi) acts as Ma Z’s lieutenant. Her gullibility and loyalty to her gang leader usually sees her being the one executing Ma Z’s bidding. The fact that she is mentally unstable and talks to her dead baby, means she should be in a psychiatric ward, but this works beautifully to her leader’s advantage. Beauty (Slindile Nodangala) is the prison’s Governor, the head whose “tough but fair mama” façade hides a manipulative and shrewd businesswoman. She wants her prison to run smoothly and her “girls” to give her the barest of problems. You see, Beauty does not want her fiefdom to be tainted because then, her underhanded and blatantly corrupt practices might be revealed. This is why she has wardens like her son Njabulo (Mthunzi Ntoyi), an academic underachiever who desperately wants to prove his worth to his mother by finally obtaining civil engineering degree and freeing himself from her prison – in every sense of the word. There’s also the ruthlessly ambitious warder Sharon (Lindiwe Ndlovu), who is Beauty’s right hand but secretly wants to occupy the Governor’s seat herself. She believes she can do a much better job, but her real motivation – like some of the women she guards – is ultimate power. This is a woman who will do anything to ascend the throne, believing it will fill the void she has lived with all her life. Lockdown will premiere on Mzansi Magic (DStv Channel 161) in January, 2017.